Happy Haloween folks. Both of these models come from Mega Miniatures. 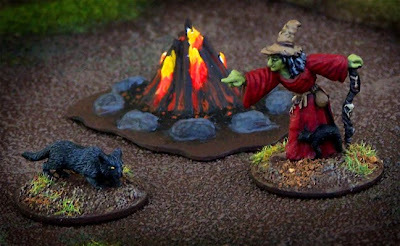 The witch was part of their 20 model Fantasy Town Folk set. I never thought I'd paint her, but then I had the idea for the Song of Blades and Heros game: Pilgrims vs. a witch and her monsters. I went for a bright red dress, rather than the typical black ensemble. The fire is molded plastic from an old 1/32 Marx playset. Excellent work there. Nice choiceo f variation on the witch. I didn't expect you to go with the green skin, but you make it work. I might add that your headless monsters from the previous post might make good summoned horrors from the Pit. There is a certain medieval charm to them that just speaks unspeakable horrors from Hell. Nice! What is a Marx playset? Thanks, dudes! Marx was a toy company popular in the 1950s - 60s. They made plastic 1/32 play sets like WWII guys, AWI, Civil War, Cowboys, Ben Hur, etc. The old molds were picked up my a few companies, so you can get re-issued figures. I think the camp fire comes from a Boy Scouts set. Did you actually get to play your Halloween game? Hi Eli, I almost did. I was going to do a solo game Friday night, but then I got too tired. Everything is painted, so I'll just make sure to do it later. Thanks for asking, I didn't think anyone was interested! Interested indeed. Would love to see how you play it out. Nice fire you have there, You've chosen the colours well. It looks as If you have a bulb inside it. I have seen bulbs on the Warlord games web site. There are battle line bulbs and torch/fire bulbs. Have a look, you might be able to put one under your plastic fire and make It glow. very atmospheric in the low light and with a witch scrabbling around it could be just the thing to finish off your village set. Wowzers. Have you done any zelda maps?